If you have ever organized a contest, my hat is off to you. It’s not an easy thing. Even the smallest local contest organizer has a lot of responsibility. It’s not a thankless job, the people that attend are always very appreciative, but as far as recognition outside of that, not much happens (and if you are running the World Championship you usually get a pile of negativity). Having said that, this article isn’t about complaining, it’s about giving you a realistic outline of what goes into running a contest. Who knows, you might actually want to run one after reading this! At the very least you might look at approaching the local contest organizer and offering to help out. For anyone who has attended a contest, you know there are some things to expect. You can generally expect qualified judges and a stage. You can expect to see vendor tables where you can do some shopping , a practice area and somewhere to sit. There’s a sound system for the music and nowadays there is an expectation of a live stream, or at least high quality video is posted to youtube afterward. There are prizes, often a raffle. A good contest usually has access to food and drink as well. You also might notice the banner with the sponsor’s logos on it. Generally this is all put together a handful of people, headed up by a single person. The Columbia Theatre hosted the 2016 Canadian Nationals. So what are the key steps needed to pull a contest together? 1. Venue. First step is finding a venue. This is varying degrees of difficult based on the date you choose. It's best to try to give your attendees at least 2-3 months notice to make any travel accessories. For this contest I usually use an elementary school gymnasium. Because I am a teacher I can generally get a really good rate at my schoool, around $500 for the day. That usually includes the sound system, tables and chairs. I have to add on event insurance though, which is another $125. Often some local parents will volunteer to go to Costco and provide a snack table and charge enough to recover costs. 2. Judges – This is always the 2nd thing I look for. There is no point in going any farther if there are no judges available. I can usually scrabble together enough people from the local community to judge smaller contests, although its usually a case of some of the 1a players judge the open division and junior division. I always try to pay judges at least something, since it’s a pretty boring way to spend your day when you could be yoyoing. Another element is having a volunteer to run the judges table and process the scores they generate into final scores.. I luckily have a parent of a local yoyo champ that is heavily involved and handles this. So tack on a minimum of $50 per judge, usually for around 4 people minimum. 3. Sponsors – With a smaller contest most of the time the best you can get from sponsors is product donations. Occasionally one or two will add a bit of cash, but for the most part they provide the prizes and raffle prizes. They don’t give away something for nothing either, there is an expectation that they are getting advertising, so someone (usually me) has to put the time into facebook, Instagram, reddit and anywhere else to give them public thank you announcements. There is a cost here, generally aroud $150 for the stage banner. 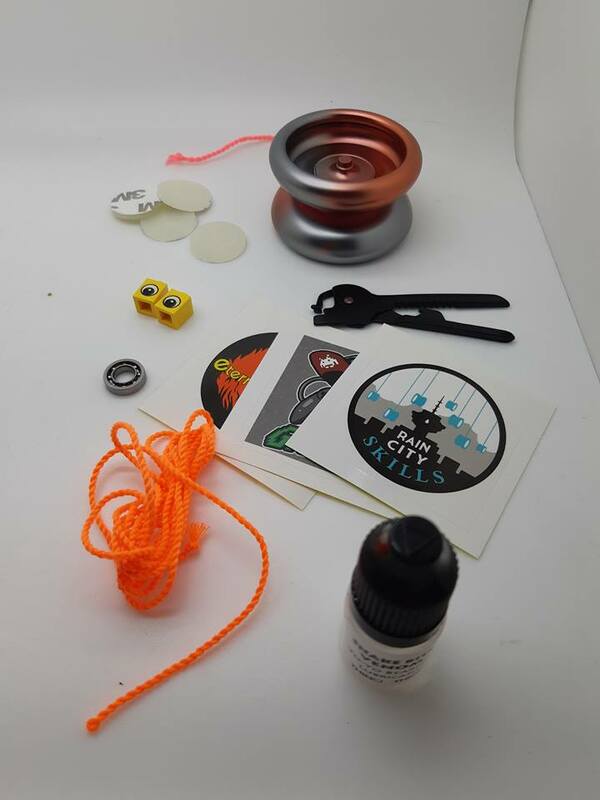 I usually treat this as a fun, small contest with the intent of providing a venue for competitiors to hone their stage skills, but mostly as a place for newer yoyoers to have fun and come together to play with yoyo. I organize a couple standard divisions (1a junior, 1a pro, open/X division). Scattered in there are various mini contests (sleeper, rock the baby showdown, walk the dog race). Here is a sample breakdown for Western Canadian Regionals and Canadian Nationals. For the most part I treat these two the same. I’m usually either running one or the other as Canadian Natinoals alternates east coast/west coast. So When I’m not running nationals, WCR serves as a replacement west coast contest for those that can’t travel. I don't know what costs are for contests outside of Canada, but they probably vary based on size and location. If you life in a major city, venue costs will be likely be a lot higher than a small town. Steve Brown recently replied to a question on Facebook regarding contest costs by providing a per minute cost breakdown of a couple contests he runs which maker for interesting reading. For a 6 hour Canadian Nationals that works out to about $400 per hour or around $6.50 per hour.